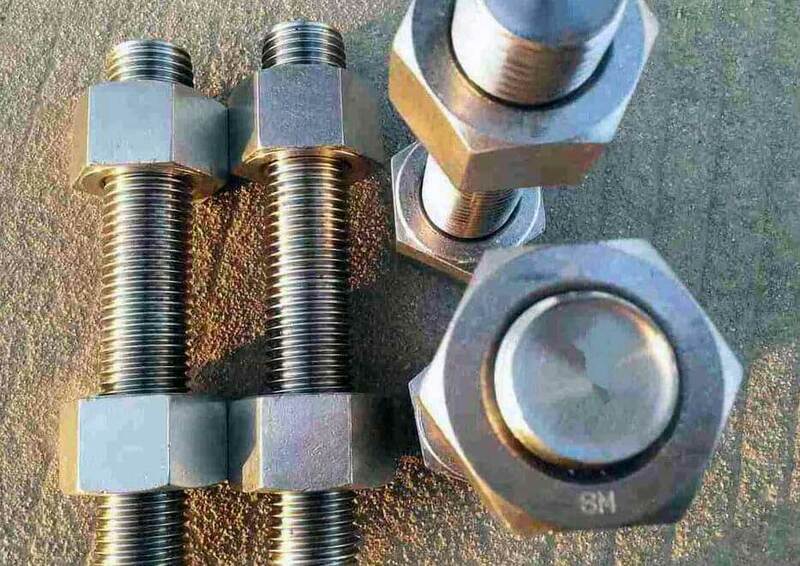 SS 904L Stud Bolts, DIN 1.4539 Stud Bolts, Distributors of ASME SA182 Stainless Steel 904L Full Thread Studs Bolts, ASTM A479 SS SUS 904L Half Threaded Studs Bolts, Stainless Steel 904L Double End Stud Bolts, UNS N08904 SS Single End Stud Bolts, Stainless Steel 904L Fasteners Suppliers in Mumbai, India. 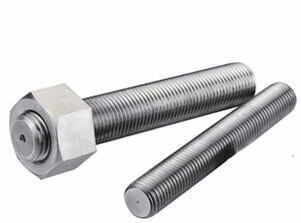 904L Austenitic Stainless Steel Stud Bolts, SS 904L Heavy Stud Bolts Manufacturer, Alloy 904L Stud Bolt, ASME B18.2.1, B18.31.3, B16.5 Stainless Steel 904L Custom Stud Bolt, A479 SS 904L Continuous Threaded Stud Bolts Wholesaler, A182 Stainless Steel 904L Weld Studs Exporters. 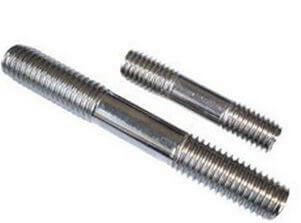 Renine Metalloys is a known trader of Stainless Steel 904L Stud Bolts, which is non-magnetic because of its make-up. The austenitic configuration of SS 904L Stud Bolts offers superior hardness even lower than cryogenic temperature, where full annealing should follow any hot work to re-attain maximum ductility and corrosion resistance. 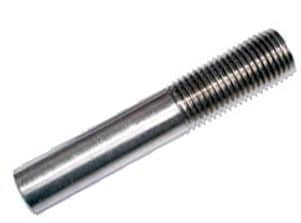 Alloy 904L Stud Bolts has good resistance to pitting and crevice corrosion, where uniform corrosion occurs in acids or in hot alkaline solutions. 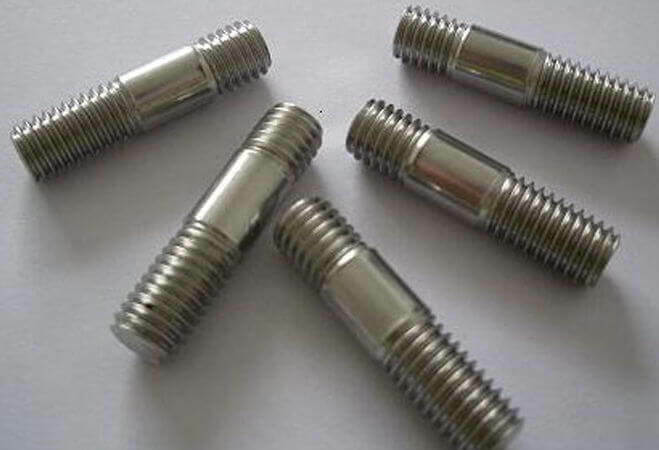 Common applications take advantage of corrosion resistance, and so Grade 904L Stud Bolts is used for Gas washing, Control and instrumentation. 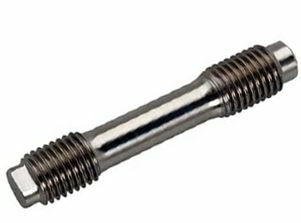 Moreover, the addition of copper to Type 904L Stud Bolts develops resistance to sulfuric acid, where its maximum service temperature is at 450 Degree C. Copper adds reducing acids, particularly in the very aggressive "mid concentration" range, where further AISI 904L Stud Bolts is often replaced by low cost duplex stainless steel 2205. 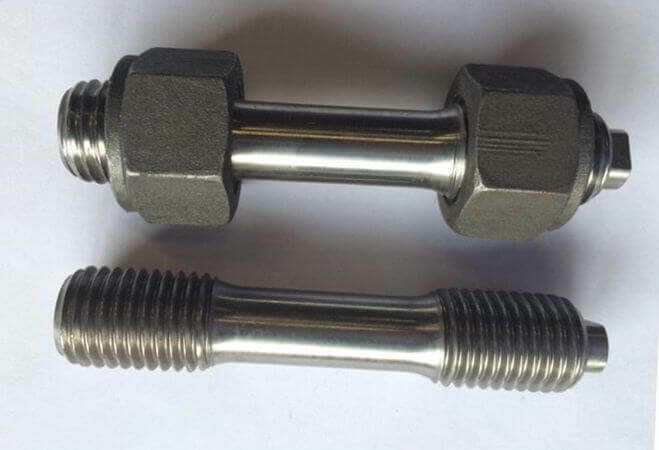 904L Stainless Steel Stud Bolts is often used in chemical processing — process equipment for the production of sulfuric, phosphoric, inorganic and organic acids and the production of phosphate-based fertilizers. 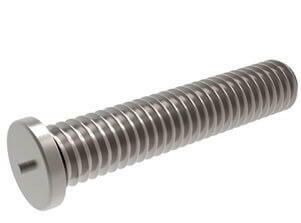 Typical uses of Stainless Steel UNS N08904 Stud Bolts include wiring in electrostatic preceptors, seawater cooling devices, oil refinery components, gas scrubbing plants, acetic, pulp and paper processing industries, phosphoric and sulfuric acid processing plants. 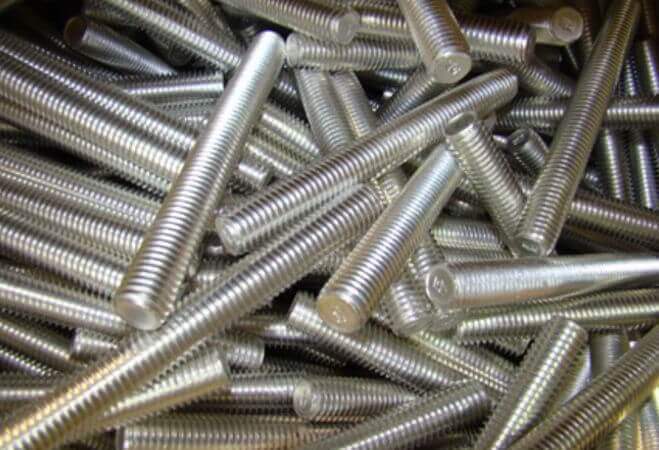 Thanks to the higher Cr, Ni, Mo and Cu content, Stainless Steel DIN 1.4539 Stud Bolts show the best corrosion resistance properties for this stainless steel family. 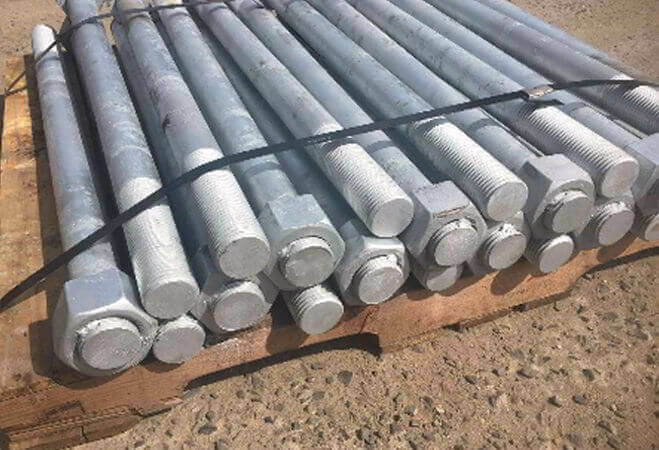 Stainless Steel 904L Reduced Shank Stud Bolt, SS 904L Stud Flange Bolts Exporters, ANSI B 1.13M 6g Stainless Steel 904L Industrial Stud Bolts, UNS N08904 Metric thread Stud bolts Suppliers, Werkstoff No 1.4539 High Tensile Stud Bolts Traders, DIN 939 SS 904L Partial Threads Stud bolts, Stainless Steel 904L All Thread Stud Bolts. Dimensions DIN / ISO / ASME / ANSI / UNI / BS / BIS / SAE, etc. Threads UNC, UNF, UNEF, UN, Coarse, Fine & BSW. Length Bolts upto 2500mm shank length. Stainless Steel 904L Fasteners, SS 904L Stud Bolts, Stainless Steel 904L Stud Bolt, UNS N08904 Stud Bolts, Alloy 904L Stud Bolt Exporters, ASME SA479 904L Stainless Steel Customized Stud Bolt, ASME SA182 Stainless Steel 904L Heavy Stud Bolts, SS 904L Cold Forged Stud Bolt, SUS 904L Stainless Steel Hot Forged Stud Bolts, SS 904L Metric Stud Bolts, AISI SS 904L Tap End Stud Bolts, SS 904L Industrial Stud Bolts, Stainless Steel UNS N08904 Fully Threaded Studs Bolts, DIN 1.4539 Stainless Steel Half Thread Studs Bolts, ASTM A182 Stainless Steel 904L High Strength Stud Bolts, SS UNS N08904 Continuous Threaded Stud Bolt, 904L Stainless Steel Double End Stud Bolts, DIN 1.4539 SS Flange Stud Bolts, Stainless Steel 904L Welding Studs Bolts, SS 904L Double End Stud Bolts with Reduced Shank, ASME SA182 Stainless Steel 904L High Tensile Stud Bolt Exporter, SS 904L Reduced Shank Stud Bolts, SS 904L Single End Stud Bolts Supplier, Stainless Steel 904L All Thread Stud Bolts, Steel 904L Metric thread stud bolts, Stainless Steel DIN 1.4539 Weld Studs, SS 904L Threaded Rod, SS 904L headed weld stud bolts Stockist, ASME SA182 Austenitic Stainless Steel 904L Stud Bolts, 904L SS Partial Threads Stud Bolt Stockholder, Stainless Steel 904L Large Diameter Stud Bolt, Supplier of High Quality Stainless Steel 904L ASTM A182 Stud Bolt, Manufacturer of Stainless Steel 904L ASTM A479 Heavy Stud Bolt Traders, Exporters of Stainless Steel 904L Stud Bolt, DIN Standard Stainless Steel 904L Stud Bolt, ANSI Standard Stainless Steel 904L Stud Bolt, BS Standard Stainless Steel 904L Stud Bolts, ISI Standard Stainless Steel 904L Stud Bolt, ISO Standard Stainless Steel 904L Stud Bolts. Haryana, Ernakulam, Lagos, Thiruvananthapuram, Seoul, Granada, Australia, Indore, Kanpur, Thane, Ahvaz, Al Khobar, Jeddah, Houston, Kuala Lumpur, Hanoi, Sharjah, Turkey, Hong Kong, Bengaluru, Doha, Chennai, Visakhapatnam, Secunderabad, Jamshedpur, Kolkata, Calgary, Bangkok, Rio de Janeiro, Noida, Dubai, Gimhae-si, Dallas, Hyderabad, Chiyoda, London, Singapore, New York, Atyrau, Colombo, Jakarta, Petaling Jaya, Rajkot, Ho Chi Minh City, Manama, Istanbul, Kuwait City, Howrah, Baroda, Faridabad, Algiers, Muscat, La Victoria, Madrid, Dammam, Toronto, Nagpur, Navi Mumbai, Chandigarh, Cairo, Brisbane, Karachi, Jaipur, New Delhi, Ulsan, Port-of-Spain, Pune, Abu Dhabi, Tehran, Ranchi, Coimbatore, Riyadh, Mumbai, Perth, Busan, Pimpri-Chinchwad, Nashik, Los Angeles, Edmonton, Mexico City, Bogota, Montreal, Sydney, Geoje-si, Milan, Lahore, Vung Tau, Surat, Caracas, Vadodara, Bhopal, Courbevoie, Gurgaon, Ahmedabad, Santiago, Moscow, Aberdeen, Ludhiana, Al Jubail. Ireland, Nigeria, Nigeria, Tibet, Belgium, Mongolia, Ghana, Sri Lanka, Poland, Colombia, Portugal, Romania, South Africa, Bahrain, Slovakia, Kenya, Iran, Namibia, Ecuador, Costa Rica, India, Lebanon, Croatia, brazil, Canada, Chile, Jordan, Ukraine, Malaysia, Kuwait, cyprus, Thailand, Austria, Oman, Bulgaria, Spain, Gabon, Yemen, Singapore, Hungary, Lithuania, Qatar, Brazil, Turkey, Afghanistan, Belarus, Australia, Russia, Sweden, Bolivia, Libya, Mexico, Gambia, Peru, New Zealand, Zimbabwe, Iran, Argentina, Kazakhstan, Serbia, Norway, Vietnam, Switzerland, Taiwan, Indonesia, United Kingdom, South Korea, Denmark, Venezuela, Israel, Poland, Morocco, Finland, mexico, srilanka, thailand, malaysia, Mexico, Philippines, Macau, Nepal, Azerbaijan, Bangladesh, Italy, Japan, Germany, Greece, Estonia, China, France, Hong Kong, Puerto Rico, Chile, Netherlands, Algeria, Egypt, Trinidad & Tobago,Tunisia, Bhutan, Saudi Arabia, United Arab Emirates, United States, Czech Republic.